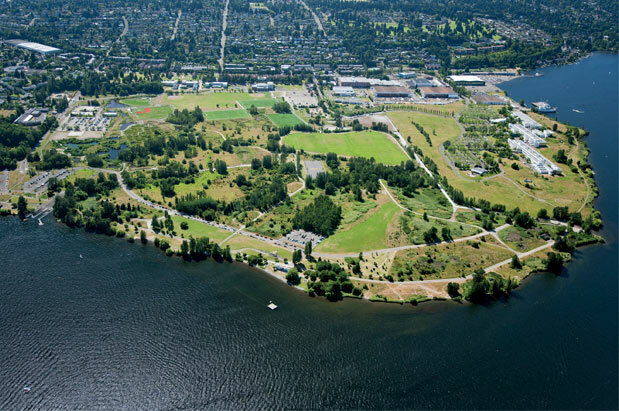 After an 11-year, $13 million overhaul, Seattle's Magnuson Park has been given new life. November’s dark, gray days are no excuse for staying indoors—especially now that Seattle’s second-largest park has undergone a major, $13 million overhaul. Long known mostly as a boat launch site and a swimming beach, Warren G. Magnuson Park, (named for “Maggie,” the U.S. senator who served from 1944 to 1981), is now a year-round recreational destination. Concrete has been converted into wetlands, and soggy marshes into playfields, while new indoor facilities attract a wide range of visitors, low cloud deck or no. In 2001, planners from Seattle Parks and landscape designers from the Berger Partnership, a leading local firm with a long history of high-profile projects in and around Seattle, began hatching plans for how to reorganize certain elements in the park to accommodate a new natural area where visitors could enjoy unobstructed views and more (and better) playfields, and wildlife could access more varied habitats. Berger had its work cut out for it; the entire peninsula was mostly flattened and paved over by the U.S. Navy when it ruled the roost there from the 1920s through the 1970s. The goal was nothing less than to create a naturally functioning new topographical and hydrological reality. The resulting reengineering across a 40-acre, formerly concrete swath is a feast for the eyes: a diverse wetland ecosystem, with preexisting trees and many new plants growing along a series of small, shallow ponds that attract dragonflies, ducks and other native wildlife. Five spiffy new sports playfields are the pride and joy of throngs of recreational soccer, rugby, ultimate Frisbee, baseball and softball players, and four more are planned. According to Guy Michaelsen, a principal at the Berger Partnership and lead on the Magnuson project, even though the new wetlands look like the work of Mother Nature, they are actually as man-made as the old Navy runway. “We don’t want people to think that this is natural, because it’s not,” Michaelsen says, adding that the design incorporates several elements to make it obvious that the wetlands were planted by humans. To wit, the 50 or so small interconnected (man-made) ponds that make up the central section of the new wetlands were excavated into squares in a grid, in part so that park visitors would view them as a kind of naturally functioning installation. But the new surrounding plants have done so well in just three years—curling, spilling over and breaking up the imaginary straight lines between the little ponds—that it’s hard to tell that the wetlands haven’t been there for eons. The new fields, three of which are lit at night, are built up as much as 8 feet higher than the old muddy fields that preceded them, to facilitate drainage. Now, they drain quickly and completely, and water flows are dispersed and filtered by soils while feeding plants and quenching the thirst of local wildlife. While some environmentalists were opposed to the use of synthetic turf on the new fields, the city says the water and maintenance savings is a boon to city coffers, and ongoing testing has revealed no pollution impact or water-quality degradation nearby from the mostly rubber fake grass. With its mile-long shoreline, public boat launch and pocket beaches, the park remains a mecca for boaters, kite boarders, kayakers and other water lovers—even in late autumn. There are boat-launch ramps in the park’s southeast corner, and paddlers can launch nonmotorized boats from several spots in the park. If you don’t have your own, rent a sailboat, kayak or paddle board (bring a wetsuit!) from Sail Sand Point (sailsandpoint.org; April–October only; proficiency test required), a nonprofit dedicated to getting Seattleites out on the water from its headquarters at the northwest end of the park. The new Arena Sports (arenasports.net) and Magnuson Athletic Club facility (macseattle.com), both of which opened in late 2010, beckon those looking for an indoor soccer game or a workout any time of year, while The Mountaineers’ new headquarters (mountaineers.org) offers meeting and event space—and an outdoor climbing wall, which anyone can use. Coming next: A new year-round tennis facility (with 10 indoor courts available at low cost) will open next spring, yet another option for urban athletes who yearn for the burn in the dark heart of autumn.